In the 2nd row, these three seats are identical and can be adjusted for your comfort. 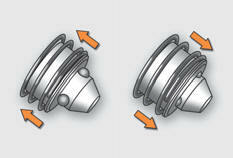 They can be placed in the table position, folded or removed to obtain a variety of loading configurations. Raise the bar A and slide the seat forwards or backwards. 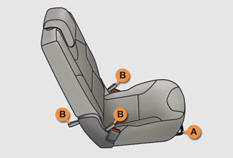 Pull one of the straps B , located at the front of the seat, then adjust the angle to one of the 7 positions offered. Release the strap to lock the seat back in this position. During the forwards-backwards and seat back angle adjustment operations, take care not to apply any force to the load space cover roller. Pull one of the straps B , located at the front of the seat. 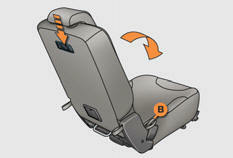 Fold the seat back fully onto the seat cushion; the seat automatically moves back fully. Press on the seat back to lock it. 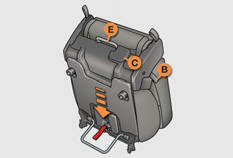 You can also carry out these operations from the 3rd row using one of the straps B , located at the rear of the seat. raise the seat fully so that it remains in the fully folded position. These operations allow access to the 3 rd row, exit from the 3 rd row and folding of the seats from the boot. lift the seat and carry it using the carrying handle E .
Never use the adjustment straps to remove, install or carry a seat; use the carrying handle E provided for this purpose (weight of the seat: approximately 18 kg). Once the seat has been removed, in order to protect its electronic systems, it must be stored in a clean, dry location sheltered from bad weather. Check that no object is obstructing the anchorages on the floor, so preventing correct locking seat's feet. Put the front feet of the seat in place in the corresponding anchorages. Raise the lever C to check that the rear feet are released. 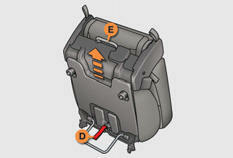 Tilt the folded seat rearwards; the front and rear feet lock automatically. 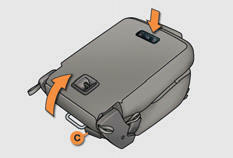 Pull one of the straps B to release the seat back, then raise it.